As I’ve found my way settling in Denver, it has been quite the lifestyle transformation! From finding different cultural and artistic opportunities for STUDIO JW to be involved with, to exploring the mountain ranges with my husband, I think about how I can mix my New York life with the Denver life, and make the two worlds meet. Many people may not know that I have a fashion merchandising degree and started my career off in fashion. In New York, I was always surrounded by the most innovative, young fashion designers on 7th avenue while I studied at The Fashion Institute of Technology. Naturally, I’ve always been in tune with what’s going on in the fashion world, even since I was a young girl. Anyone who has lived in New York can tell you that in a fashion capital, having good style is NOT up for debate! The industries of fashion and interior design have their own unique dynamics, however, they have formed a close-knit relationship where ideas trickle down from one industry to the next. I think it’s fair to say that there’s a crossover between the two industries. As a designer myself, it’s important that I stay on top of the latest forecasting, and that I continue to be aware of what direction different designers are heading. It’s empowering to see so many designers who have branched out to different areas of design, and this seems to be a growing trend for designers who have made a name for themselves. In an ever-changing world of design - fashion, interiors, and graphics - I can gather inspiration from nearly anything! Whether it's a complex patterned fabric or drape from clothing, or the most minute detail in a piece of art, inspiration is all around! With fall right around the corner, we’re keeping up with what’s happening on the runway to inspire ideas for our interior projects. One of my personal favorite fashion houses to follow, Chanel, showcased models in the Chanel Couture Fall 2018 fashion show strutting through an enchanted forest – fabulous for the fall time! Above, model Yvonne Bevanda's fierce, edgy tone is set with a combination of layered materials and an enticing pop of emerald green; it's a technique interior designers know and love (including myself!). A careful and deliberate combination of elements like line, shape, form, and texture in both fashion and interior styling makes for a complex and pleasing design that evokes an array of feelings. This gives designers and stylists the satisfaction of being able to create visually dynamic compositions! A blend of neutral tones in a collection seems to never go out of style; both in fashion and home décor. We've been following Pierpaolo Piccioli’s Valentino Fall 2018 Couture collection including this look that's monochromatically rich in texture and drape. This concept can also translate into a calming and warm space in the world of interiors. 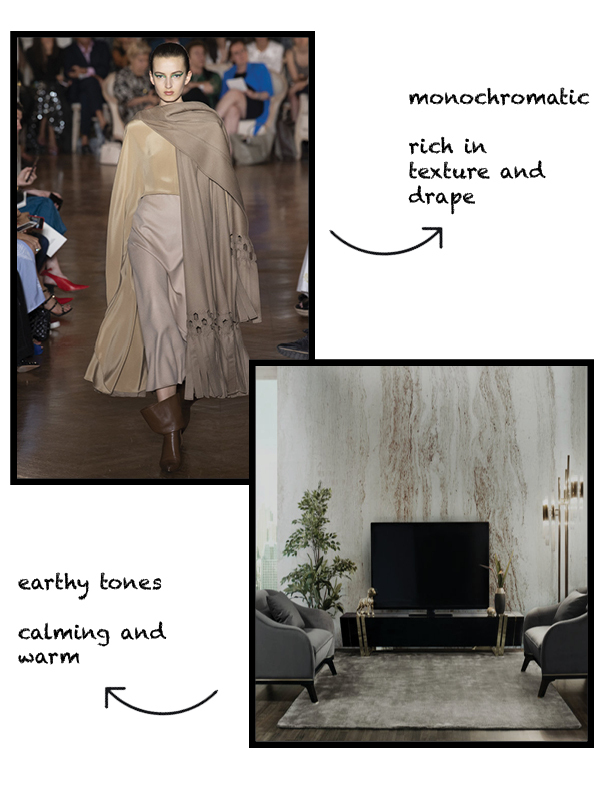 While model Maisie Dunlop exemplifies that simplicity in fabrics and color will always be timeless, translating it into an interior lends to a modern and beautifully-contrasted space from earthy tones that showcases rich textures! Adding to the chic, earthy tones that we're obsessed with, the Fendi Fall 2018 Ready-To-Wear collection consisted of a contemporary blend of neutrals, subtle fall colors and a lot of plaid! The mixture of fur, suede, and leather for model Rocio Marconi screams chic and sophisticated in one design. The collection was all about women empowerment, and the model above exhibits a powerful and feminine look. We love making a statement in the interiors whether it's through unique textiles or decorative artwork. In this high-gloss interior, the artwork with stilettos shows an image of power! The over-scaled tufted sofa combined with a mix of metals with plush fabric is the perfect combo for a luxuriously polished and sleek space. It doesn't get anymore glamorous than this! Not only do colors portray different moods within color context, but they also play an important role in creating harmony throughout a composition. Primary colors are timeless, and both designs above appear light and airy when primary and secondary colors are put against a white background. Although saturated red is stimulating, shades of blue add a sense of calmness in this interior décor. As designers, we're always deciding between using complementary colors or analogous colors when trying to achieve harmony in a design. If there’s one thing we can sum up about designers, it is that our influences and approaches to our work comes from the world we surround ourselves with. One’s ability to indulge themselves in culture, history, and other monumental influences enables them to lead with innovative design and upcoming trends. The blend between fashion and interior design allows for a shared vision to create art and choreograph beyond-magical storytelling! Let us know what you think about the worlds of fashion and interior design coming together! Have a project inquiry? Ready for a consultation? We'd love to hear from you!